HeadCount founder Andy Bernstein said that with the help of nearly 2,000 volunteers who canvassed at Saturday’s march, his organization registered more people to vote Saturday than any other day in its 15-year history. “This is the first time we’ve ever done a march,” Bernstein told BuzzFeed News. The voter registration numbers from HeadCount do not include online voter registration and the number of voters registered through other voter registration organizations, according to HeadCount spokesperson Aaron Ghitelman. Although the organization mostly focused on registering voters at concerts and music events before the March for Our Lives, the father of one of the gun control student activists at Marjory Stoneman Douglas High School convinced the organization to partner with the anti-gun march. Ghitelman told CNN that the father of Marjory Stoneman Douglas activist Cameron Kasky got in touch with the organization to get the group to register voters at the March for Our Lives. HeadCount’s canvassers were not the only ones registering people to vote at the rallies. Other voter registration organizations who conducted get-out-the-vote efforts at gun control marches throughout the U.S. included left-leaning groups Forward Alabama and Palm Beach Indivisibles. The groups, as well as the official March for Our Lives event, also promoted online voter registration. The “DIY Voter Registration” page encourages community organizers to start their own voter registration drives and makes any organizer who agrees to do a voter registration drive to affirm that they would report the results of their registration drives to the March for Our Lives through a survey. It is unclear whether march organizers will release the results of the registration drive surveys to the public. The “Register to Vote” page encourages prospective voters to enter their email address and zip code to see if their state offers online voter registration that can be completed in less than two minutes. 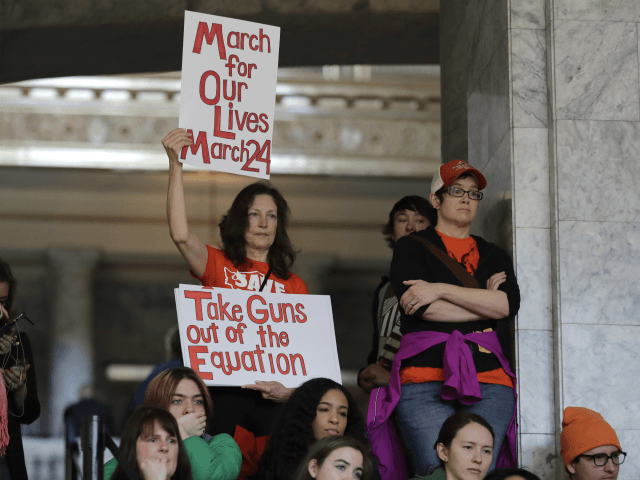 The gun control-supporting students behind the march say that they hope these get-out-the-vote efforts directly impact turnout in future elections. Second Amendment supporters say they are taking these get-out-the-vote efforts backed by these gun control groups seriously, especially as the upcoming 2018 midterm elections draw closer.